We here at the ‘Cult have always been inspired by mourning rituals and attire of various cultures and eras. What’s fascinating about burial customs in particular is how they reflect the values and culture of the people they belong to, even as their lives evolve and change with time. Some traditions are dropped entirely and others are developed. Korean Burial Beads– in South Korea available land for burial plots is dwindling so many families opt for cremation. Companies have sprouted up offering to turn the ashes into compressed beads. These beautiful beads are often displayed in the home in glass urns or elaborate dishes. Mourning and the way we honor those we have lost evolves to suit our culture and lives, this is a fascinating way to see that in action- how people develop new ways to maintain tradition and respect as their world changes. Obviously not my photo. If it’s yours let me know and I shall credit it! More info on this tradition here. Sokushinbutsu- A now outlawed Buddhist tradition where priests slowly mummified themselves. Seen as taking the path of extreme austerity to enlightenment, rather than closely killing oneself. The process itself is kind of terrifying- beginning with starvation and then preserving your digestive tract with the sap of a poisonous tree, and finally sealing yourself in a tiny stone room while waiting to die. More info on this can be read here. 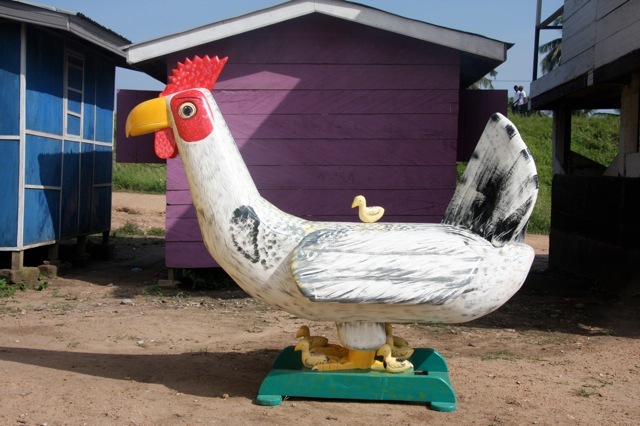 Ghana Fantasy Coffins- In Ghana coffins have become a status symbol. Created in the shape of pretty much anything. From airplanes and cola bottles to fishes! These coffins often symbolize the passions of the deceased. Used as a way to gain favor with the powerful deceased ancestors these elaborate coffins have appeared in art galleries across the world. More info on these here. ← Gloomth Fan Art Contest 3.0!